After great fanfare abroad, the heralded Amateur Olympia contest has finally made its way stateside on Sept 14 at Joe Weider’s Olympia Fitness & Performance Weekend. With the battleground taking place at the Orleans Hotel and Casino, this will mark the very first time the Amateur Olympia will be held in the United States. IFBB and NPC competitors from USA, Canada, Mexico, South and Central America, as well as the Caribbean are welcome to participate in this ground- breaking event. The tireless efforts of American Media, Inc., the NPC and the IFBB has the industry buzzing: 2 Pro cards will be awarded for each division. In total, 10 coveted IFBB Pro cards are up for grabs to the dedicated athletes competing in the contest. 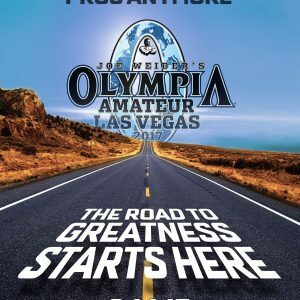 The Amateur Olympia is scheduled to be held at the Orleans Hotel and Casino Showroom on Thursday, Sept 14th with a check-in taking place on Wednesday, Sept 13th. Never before in history have amateur athletes had the opportunity to grace the same prestigious event as the likes reigning 6x Mr. Olympia Phil “The Gift” Heath, the former Mr. Olympia Dexter “The Blade” Jackson, Shawn Rhoden, Mamdouh “Big Ramy” Elssbiay, and the return of the legendary “Sultan of Symmetry,” Flex Wheeler. Be a part of the Olympia Weekend with the best in the world, including a chance to rub delts with none other than blockbuster celebrity, Dwayne “The Rock” Johnson, who will be in attendance. Enjoy an awesome weekend at the jam-packed expo with over 300+ of our industry’s leading companies that’s full of friendly fellow fitness enthusiasts and fans. Cap off your trip with the SuperStar seminar on Sunday. At the Olympia Weekend, it’s fitness and bodybuilding 24/7 in Vegas. Are YOU the next Amateur Olympian and IFBB Pro? The road to greatness starts here. Visit http://amateur.mrolympia.com for more info.